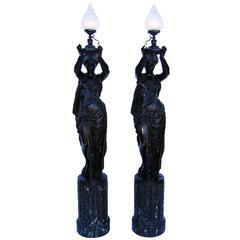 Pair of 20th century vintage Christopher Wray plaster figural lamps depicting Roman women, signed by artist. M. Osman. A vintage floor lamp made of metal and brass, standing on three brass legs, in a good condition. 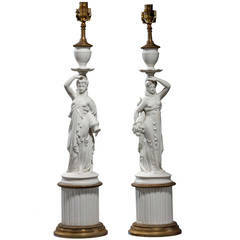 Measures: Base 6" H x 13" W x 13" D Lampshade: 16" W x 16" D.
Pair of white biscuit porcelain Lamps of neoclassical design on original bases with gilt decoration. RR. 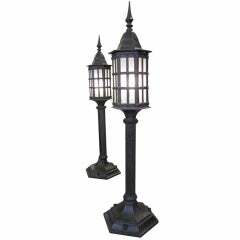 Pair of cast iron pier lamps. Priced per pair. 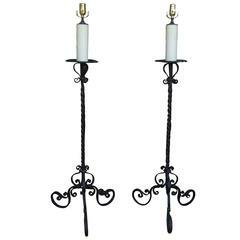 Pair of early 20th century iron floor lamps. 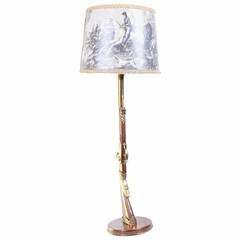 An Italian vintage floor lamp with a small round table made of brass and rosewood on three elegantly curved feet.